I’m one of the many people who love Jamie Oliver cookbooks. This cookbook focuses on recipes with 5 ingredients and has a wide range of recipes sure to please. 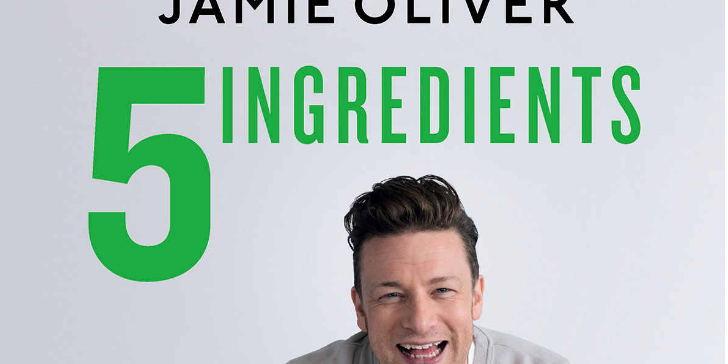 Cooking doesn’t have to be complicated – that’s why Jamie’s Quick & Easy 5-Ingredient Food is sure to become your new best friend in the kitchen.It’s all about making the journey to good food, super-simple. Every recipe uses just five key ingredients, ensuring you can get a plate of food together fast, whether it’s finished and on the table super-quickly, or after minimal hands-on prep, you’ve let the oven do the hard work for you. We’re talking quality over quantity, a little diligence on the cooking front, and in return massive flavour. Each recipe has been tried and tested (and tested again!) to ensure the book is packed with no-fuss, budget-friendly dishes that you can rustle up, any day of the week.With over 130 recipes, and chapters on Chicken, Beef, Pork, Lamb, Fish, Eggs, Veg, Salads, Pasta, Rice & Noodles and Sweet Things, there’s plenty of quick and easy recipe inspiration to choose from. Think Roast tikka chicken – a whole bird rubbed with curry paste and roasted over golden potatoes and tender cauliflower, finished with fresh coriander. Or, Crazy simple fish pie – flaky smoked haddock, spring onions, spinach and melty Cheddar, all topped off with crisp, golden filo, and ready to tuck into in less than 30 minutes. With every recipe you’ll find a visual ingredient guide, serving size, timings, a short, easy-to-follow method, and quick-reference nutritional information. This is Jamie’s easiest-to-use book yet, and the perfect cookbook for busy people.